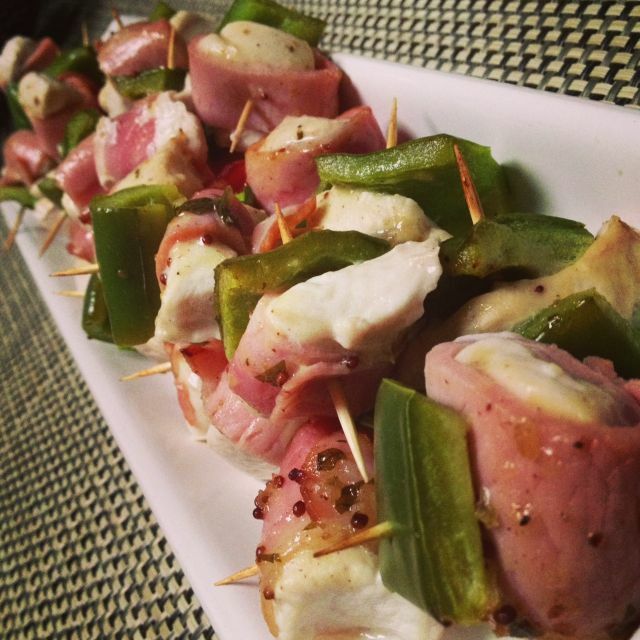 Paleo Maple Mustard Chicken Bits Wrapped in Bacon. By now, if you have been following along, you would know that our lives revolve around exercising, eating right, socialising, family time, studies, oh and of course work! Four months ago we had our schedule down pat with all of these factors covered. We finally were happy inside and out. It only took…our whole lives. This was a massive achievement! Since hitting our teens, or maybe even earlier, we had the all too common internal battle with our weight and self-confidence, but finally we found a way of life that worked. So, naturally we wanted to share it…welcome: this blog! 1. it is our creative outlet. 2. we get to talk about food all the time (we always do this…but now we have a reason to). 3. we can promote a healthy lifestyle and motivate others (our favourite reason). So JUST after getting our life schedules all scheduled right, some re-evaluation is now required. It just shows, you can never stop, the journey is never ‘over’. Now to what you have all been waiting for! Thanks to everyone who entered our blog re-launch giveaway. We loved reading the variety of fit + healthy plans and were overwhelmed with the support, feedback and encouragement…you are all a part of our fit + healthy plan and we wish we had a prize for every one of you! But there can only be one winner! Jess! Who wrote her fit + healthy plan as a haiku poem: paleo pancakes, equals deliciousness and living healthier. We will comment on your post to get your details! Congratulations! Thanks again to our friends at Paleo Snacks, Rachael’s Organics, SlimBliss Tea and Mount Uncle’s Banana Flour for supplying the healthy hamper goodies. To celebrate being healthy and our blog (+ our re-evaluated life schedule) here is our super speedy go to snack recipe for paleo maple mustard chicken bits wrapped in bacon. You have just gotta try this one! Cut the chicken into two cm cubes. Cut the capsicum into two cm squares. Slice each piece of bacon long ways into three. Wrap a slice of bacon around a piece of chicken and slide onto a toothpick. Slide a square of capsicum onto one end of the skewer. Continue until you have no ingredients left. Place all skewers onto a lined baking tray. Brush a little maple mustard on top of each of the skewers. These are great served hot or also cold and are a perfect party starter!